I did not want to get up, especially as the wind was howling and the rain was lashing against our windows. Also, I was sure that the walk would be cancelled! However, I got up as though I was going to be walking and packed my lunch before trying to phone Richard with my mobile phone(our land line being out of order) – only succeeding in leaving a message on his answer phone. I phoned Cath who said she was all ready to go and would be doing so unless I heard of a cancellation but when I got through to Jim he said that we would be walking, even if it was an alternative! Cath was here about 8.15am and she drove me to the Cairnsmore car park where we met Richard and Jim. Duncan arrived a bit later. So there were just 5 of us! 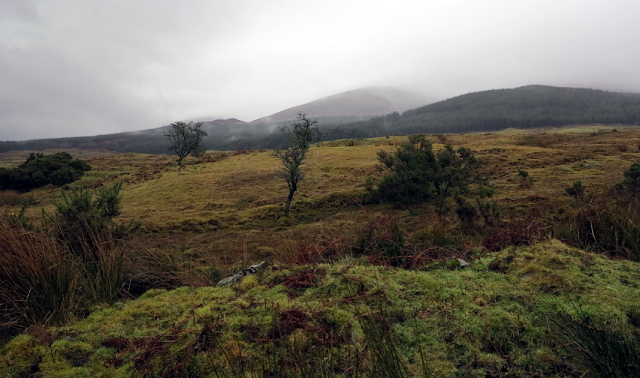 The weather on Saturday morning was atrocious with heavy rain and a cold, gusting south easterly wind. 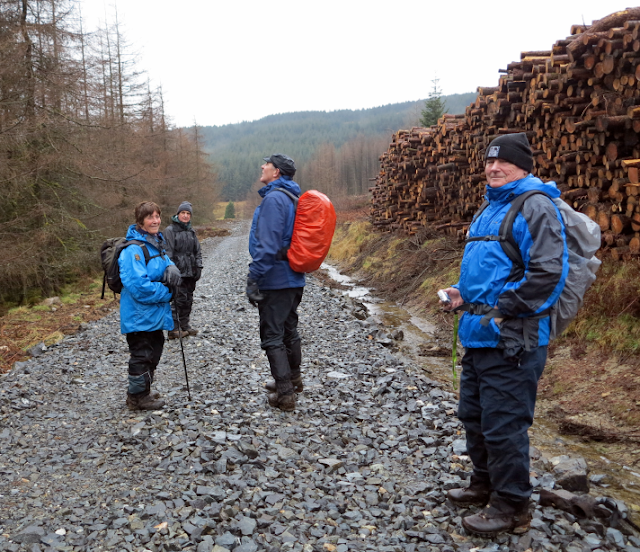 The numbers were depleted by a mixture of pre-Christmas preparations and the weather so only five members assembled at the car park near the Cairnsmore viaduct. After a short discussion the group decided not to attempt the planned walk which would have involved a long walk over exposed moorland towards the Door of Cairnsmore. Instead they decided on a less ambitious walk through the forests on the lower slopes of the Cairnsmore. The group set off up the traditional summit path until they had crossed the first section of recently replanted forest. On passing the dyke they turned into the forest out of the wind and rain and followed a brashed track through the trees which climbed gently towards the forest road. It was rather dark under the trees but the wind had disappeared and the rain was confined to a few drips from the forest canopy. I kept my camera in my rucksack for a while, only getting it out when I was desperate to take a photo, and then I kept it under my jacket for easier access. I was amazed to find later that I had taken 84 photos, some of which had an ‘atmospheric’ misting over part of them – caused by dampness getting in between two lenses! However, some of them came out reasonably well. A short climb brought the group out onto the forest road just below an area of Larch which had been felled as part of the control measures for the Phytophthera disease. They passed the piles of logs at the roadside and crossed the Cairnsmore burn which roared through its culvert below the road. Here they emerged onto open land and once again felt the force of the wind and rain. Misty views towards the Cree valley were admired briefly then the group crossed quickly to the northern section of the forest. The forest road wound northwards through the trees. 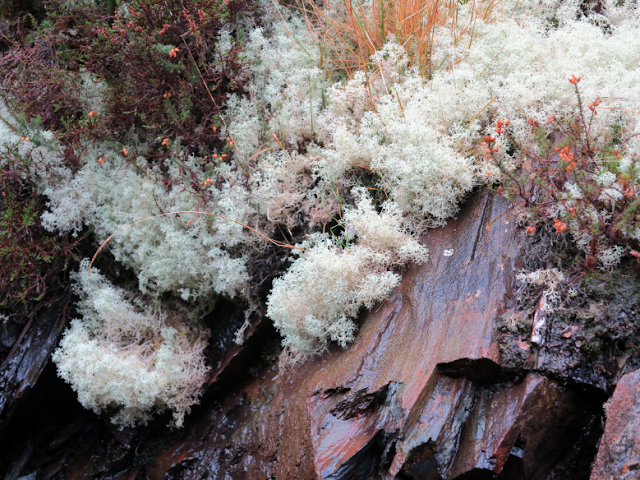 Along the way they were fascinated by the moss and fungi which grew on the roadside banks and old logs. They obviously appreciated the dank conditions. Despite the rain, I was taken with the colours of the fallen leaves and, having removed a lense from my camera and therefore the misting, I was able to get some photos of the lichen and fungus in various places. 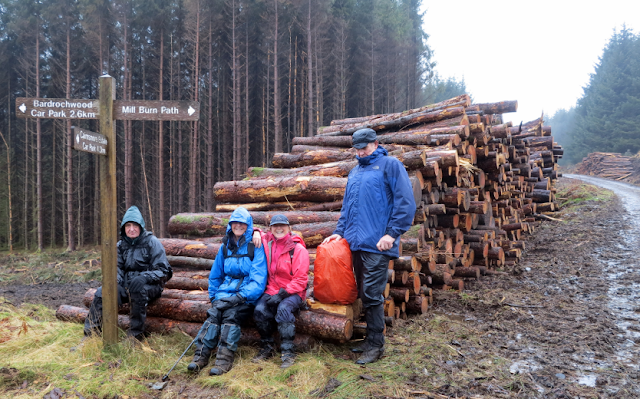 Two more areas of felled Larch were passed and the group soon reached the top of Jock’s Brae. 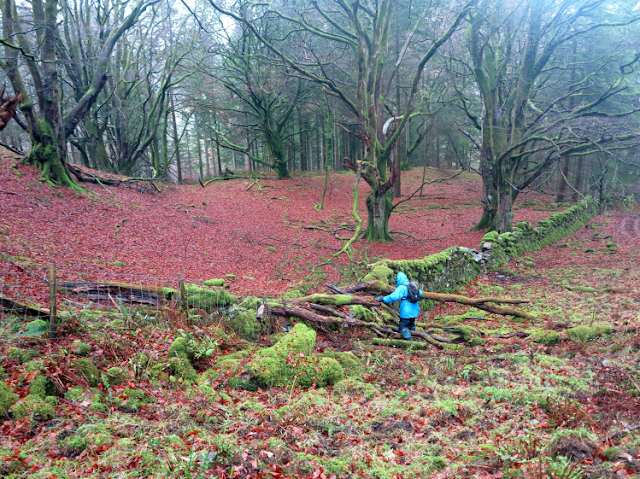 Here they turned off the forest road and followed an old track down into the valley of the Knock Burn. 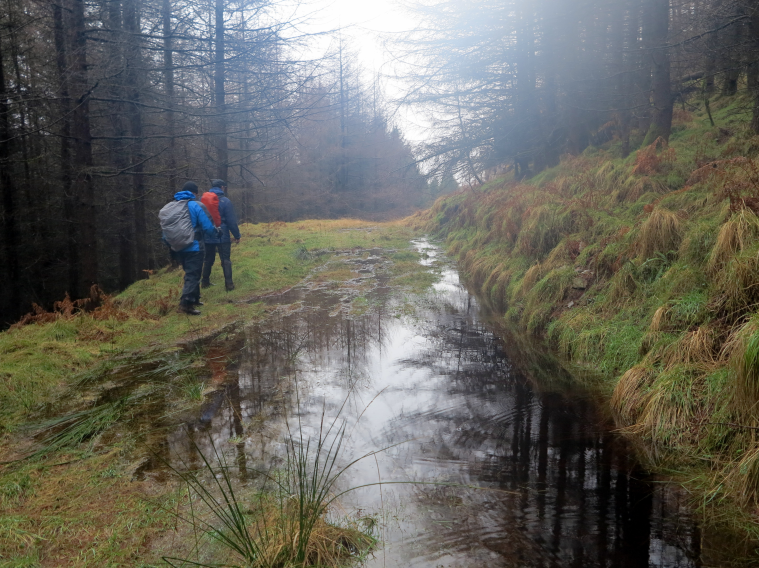 Once they crossed the burn they found a sheltered area under large spruce trees for lunch. Before then Richard had aided our blood sugar levels to rise by dishing out jelly babies! 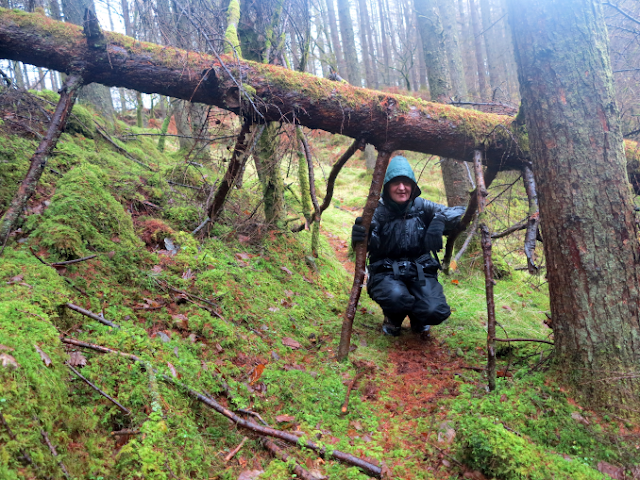 We perched on a moss covered dyke which had seen better days and the rain found its way through this opening between the trees to fall on us, our sandwiches and our drinks! However, we were suitably revived when we set off again. 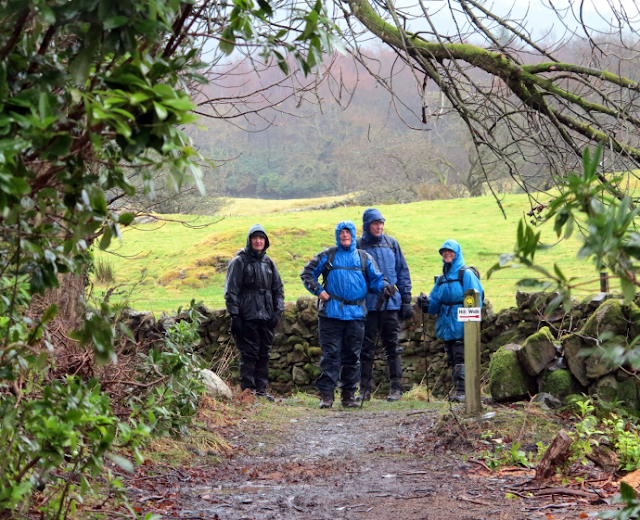 After a leisurely lunch the ramblers continued along the grassy track and eventually reached the end of the wood and emerged once again into the wind and rain. A short passage across the field led them to an old track which descended through the older woods towards Bargaly Farmhouse. 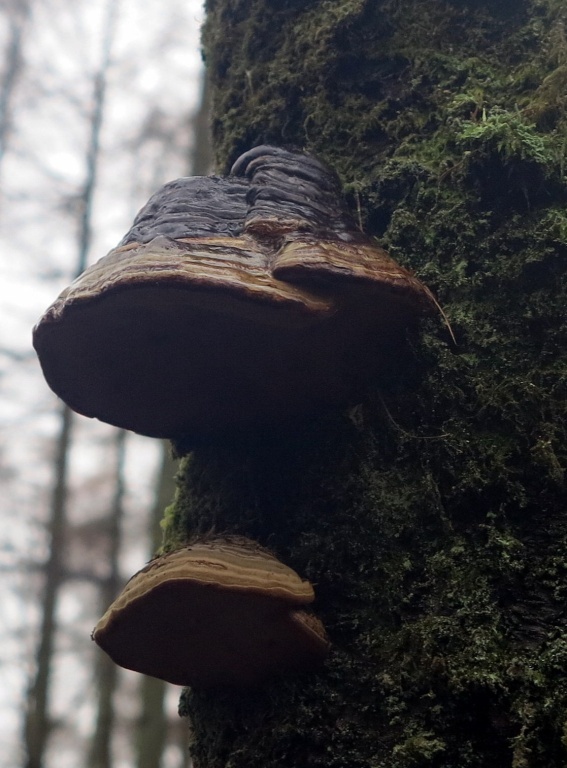 However, the group turned off the track and walked between some old beech trees which had grown into fantastic shapes and were festooned with moss and bracket fungi. 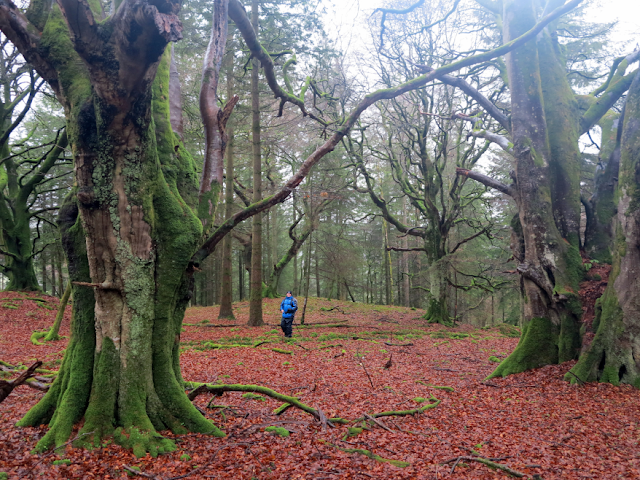 After passing these trees they walked through Larch and Spruce woods seeking an old track which led down to Bardrochwood. Eventually they found a track which connected a series of old charcoal burners’ platforms and they reached the valley road just before the Mill Burn bridge. Across the burn they could see an unusual elongated motte with one sheep proudly surveying the countryside from its summit. Richard was in constant communication with Andrea who wanted us to make sure we did not get back to their house before 3pm! We joked about going round in circles to make up the time but actually the walk was timed brilliantly. 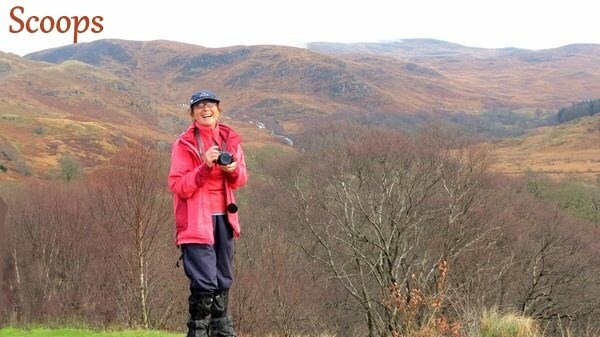 However, following one such phone call when Richard gave an estimated time for the end of our walk to Andrea, who was out walking with Irene and Isobel, she, thinking our arrival would be earlier than anticipated, cut short their walk by half! After crossing the bridge they turned off the road and followed the farm track past the steading and up the long slope up to the Machars Hill. After viewing the motte there, a more traditional round one this time, they followed the tractor tracks across the fields to Strathmaddie farm. They descended to the road again and were soon back at the cars, a somewhat dedraggled but cheerful bunch. We got the all clear from Andrea as we got back to the cars and then were held up while Jim hunted, in panic, for his car keys. He checked everywhere over and over before finding them in the lining of his over trousers. He had a small hole in his pocket through which the keys had fallen, down to the bottom of his trousers – what a relief for us all! 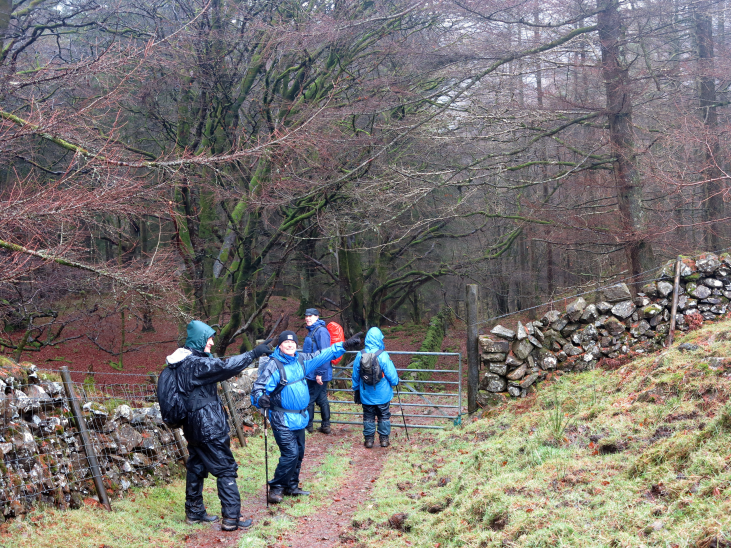 Another group, who had declined the more strenuous walk, met at the secretary’s house and took a short walk around Doonhill Wood and Blairmount Park in Newton Stewart where they followed the paths which had recently been upgraded by the Cree Valley Community Woodland Trust. They particularly admired the boardwalk and dipping platform which had been constructed around Blairmount Pond. They were disappointed to find that the swans had emigrated for warmer, or drier, climes. After the walks both groups met up back at the secretary’s house for the traditional pre-Christmas mulled wine and mince pies. I could only manage a piece cheese on toast later while we watched the first part of ‘Strictly’. The second part came later in the evening - I had expected Kimberly to win but the trophy went to Louis Smith (gymnast who got a silver medal in the Olympics) after his amazing show dance! Jim was pleased with that result.